Spring is here at Gibbs Gardens and flowers are abundant. Following good cultural practices will help ensure that your own garden thrives too. And, when it comes to pruning, there are a number of things to consider. Knowing when the best time is to prune your flowering shrubs, depends on the particular type you are growing and when they flower. 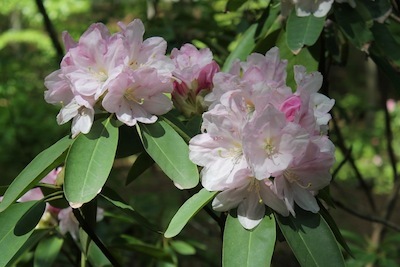 With many spring bloomers, including viburnums, azaleas, rhododendrons and mountain laurel, Jim recommends that you prune as soon as they finish blooming. Remove spent blossoms before they set seed. This will help keep your shrubs vigorous and encourage them to put energy into forming next year’s flower buds and new growth, instead of seed. Because they form next year’s flowers during the summer, it is best to prune your azaleas and evergreen rhododendrons before July. Other shrubs like oakleaf hydrangea only need pruning to remove dead wood or to control the size of the plant if it is getting too large for the space you have allocated. You can remove dead wood (this is true for all shrubs) at any time of year. Shrubs that flower on current season’s growth including Annabelle hydrangeas, butterfly bush and P.G. hydrangeas such as Hydrangea paniculata ‘Limelight;’ should be pruned in early spring before new growth starts but, you can still prune them back now, if needed, and not sacrifice flowers for this season. They may bloom a bit later but they should be healthy and robust. Erica Glasener writes a monthly article for Gibbs Gardens Blog, where this article also appears. We are thankful for Erica Glasener & Jim Gibbs permission to use this very informative article for our readers. A horticulturist, author and lecturer, Erica was the award-winning host of HGTV’s A Gardener’s Diary for 14 years. As the host for this popular TV show, she introduced her audience to gardeners, horticulture professionals, specialty plant growers, landscape architects and more from across the country. In July of 2011, she received a Garden Media Award from the Perennial Plant Association. For over ten years she wrote a column on plants and garden design for the Atlanta Journal-Constitution. She has also written about gardening for Southern Lady Magazine and served as a contributing editor for Fine Gardening. Her articles have appeared in The New York Times, The Farmer’s Almanac and The Green Guide. A frequent guest on regional and national lifestyle radio programs, she enjoys helping people solve garden problems. A popular speaker, she presents lectures at garden shows across the country from Seattle to Epcot. The author of several books, her latest is Proven Plants: Southern Gardens.